It’s another Grab Box day!!! Get a box filled with popular products at 50% or more off of retail value. Plus you’ll get a deal on shipping/handling. Purchase this Goodie Box (retail value $120 US / $140.95 CAN) for only $60 US/ $70.50 CAN. Buy now! This offer is while supplies last and will be snatched up quickly! Supplies used are all CTMH: You Rock Level 2 Paper Packet, Dimensional Elements – Stars, Outdoor Denim Mini-Medley (includes buttons & ribbon), Goldrush Cardstock, Outdoor Denim & Goldrush ink, and Building Blocks Alphabet stamp set. Layout Challenge: #52 of 210. 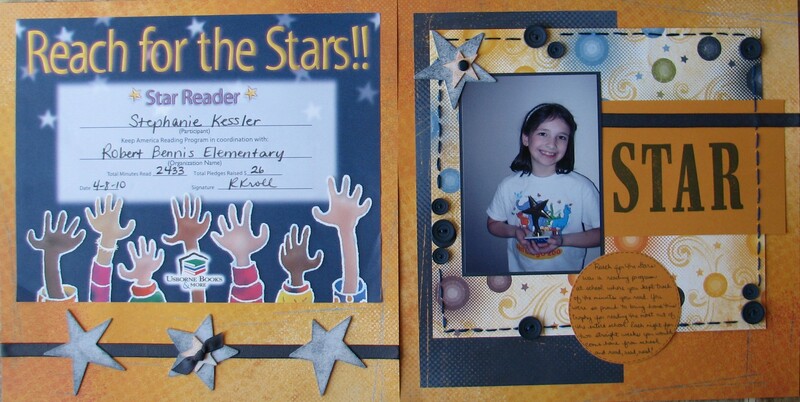 Stephanie was so proud to bring this certificate and trophy home from school. And rightfully s0! For 2 weeks straight she would come home and read, eat, read some more, and go to bed. She even took a timer to school to keep track of when she read during free time. It’s all the kid did was read! So it was great to see that she was rewarded for it. She read the most minutes during that time period out of not only her class but the entire elementary school!